Data creates another android, Lal, but Starfleet immediately takes an interest in the research value of his "project" and insists that Data turn her over to them. Only Patrick Stewart can get away with using the word "stupendous" like that. 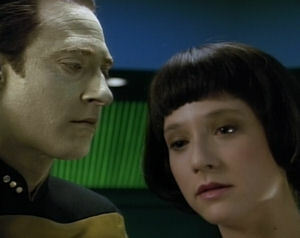 I wonder if Data confers with Commander Maddox at any point during this episode. The Andorian model looks extra cheesy, like a Halloween costume. It definitely doesn't seem to fit the more modern TNG look. Dr. Crusher really wants her son to get a haircut, but Wesley doesn't need one. Admiral Haftel acting like an assisting surgeon is a little too hokey. I like the line about Data's hands moving so fast he couldn't keep up, but the actor puts way too much emotion into it, flying completely in the face of his character as it had already been established. I don't dislike this episode--it is a strong bit of drama--but I don't feel like it says anything new. Even though it introduces an interesting metaphor about parenting by exploring the inevitable sci-fi topic of androids building androids, it still covers much of the same ground as "The Measure of a Man." Emotionally, it's successful (and I'm man enough to admit that I tear up a bit when Lal dies), but as a way of developing Data further, it doesn't work. From the standpoint of Picard, it almost feels like a step backward, because at the start of the episode, he refuses to consider Lal a child, not coming around to the idea until late in the episode; it's almost as if he has totally forgotten what he learned in "The Measure of a Man." Data's lesson to Lal that we must "strive to be more than we are" is, in my opinion, the single biggest theme in all of Star Trek. Roddenberry's vision is of a future where humanity has become better in every possible way, and that is what he wanted us to strive for. We see it again and again, and it is the centerpiece of Star Trek: Nemesis.